My hair frustrates me no end. Oily roots, dry ends and little halo of frizz mean it never looks quite the way I want it to. I’ve also never been particularly skilled at styling it. I thought it was about time I showed my hair a bit more love, so I’ve invested in some new products and I’m planning to cut down on heat styling. I already use sulphate-free shampoo, so I’ve got a bit of a head start there, but unfortunately the one I’ve been using just isn’t working the way it used to. I’m hoping the Neal’s Yard Remedies Nourishing Lavender Shampoo will be kinder. Unlike most shampoos for fine hair, which concentrate on creating volume and are often quite drying, this one also provides moisture without weighing hair down. It also contains a lot of oils, which I hope will calm and soothe my scalp. The lavender scent is strong, so I imagine this is a good one to use before bed. It’s difficult to find something that softens fine hair without weighing it down. If I use a conditioner that’s too heavy, the ends of my hair get all stringy, which isn’t a good look for anyone. Luckily, Yes To Coconut seem to have created the perfect blend with their Ultra Moisture Conditioner, because every time I’ve used it my hair’s felt smooth and looked healthy, not lank. The coconut smell is divine, so do have a sniff if you spy this in Superdrug. It’s rare for me to remember to use a hair mask, but I couldn’t resist trying the Neal’s Yard Remedies Rosemary & Cedarwood Hair Treatment. A mix of coconut oil, cedarwood oil, rosemary leaf oil and lavender oil, it claims to add shine and condition all hair types. It’s suitable for your hair and your scalp, so I’ll use a small amount all over, concentrating on the ends, then popping on a towel turban and leaving the mask in overnight. Fingers crossed I wake up with fabulously glossy hair, not a greaseball. Finally, I thought I’d add an on-the-go product to add a little bit more shine (and treat my ends if they’re dry). The OGX Coconut Water Weightless Hydration Oil comes in a spray bottle, so it mists over hair and means you’re less likely to apply too much — ideal for thin strands like mine. 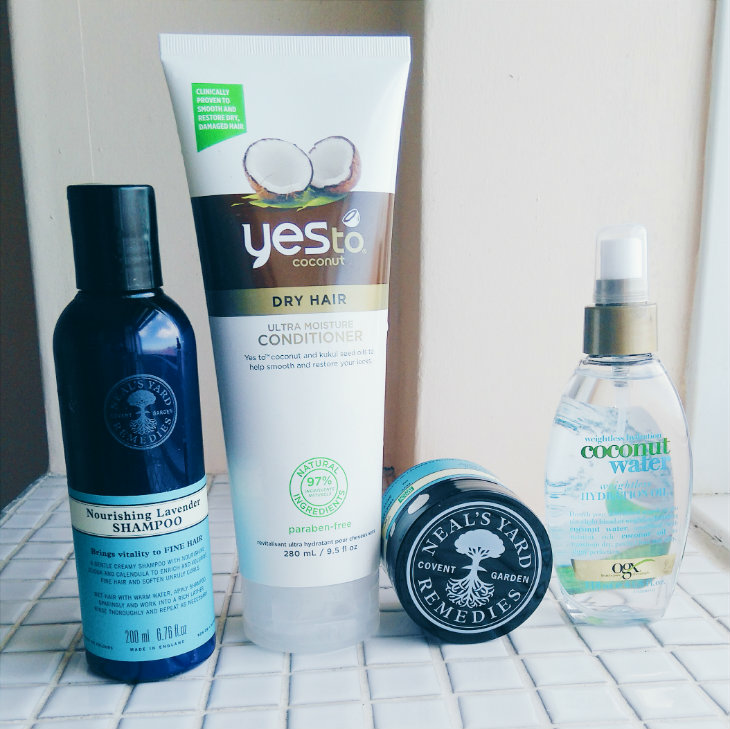 As well as using these products, I’ll be avoiding heat styling, making sure the temperature of the shower isn’t too hot, and limiting the amount of junk food I eat. I’ve heard there’s no scientific evidence your diet affects your hair and skin, but whenever I eat better I look and feel better, so I’m convinced there must be some kind of link. What are your favourite pick-me-ups for hair? Have you tried any of these products?